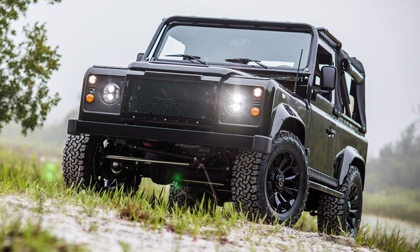 KISSIMMEE, FLA. – June 23, 2017 – East Coast Defender has once again set the standard for custom Defender builds with its latest project, “Honey Badger,” a handcrafted Defender 90 featuring a powerful LS3 V-8 engine with a new manual transmission option. Built to withstand rugged, off-road abuse, the Honey Badger’s six-speed manual transmission is the most capable available and reflects the high-quality craftsmanship and engineering prowess of the ECD team. Each East Coast Defender SUV is a pure, handcrafted vehicle. Like its namesake implies, this “Honey Badger” is an aggressive vehicle that’s incredibly tough and capable of taking on the harshest terrain. Each SUV is purpose-built to a client’s needs and specifications. This is the second Defender commissioned for this particular client, which speaks volumes about the design process and quality. 18-inch Sawtooth wheels with BF Goodrich All Terrain KO2 tires.